Overwatch Leaks Year of the Rooster Event | Nerd Much? 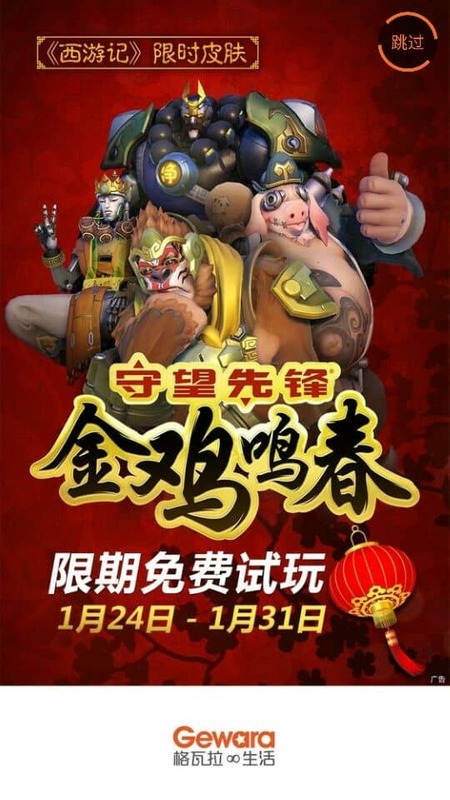 Two tweets from Overwatch, one from the American account, and another from the Korean, have posted what appears to another not-event for Overwatch for the Chinese New Year. It will likely include skins and loots boxes just like the last not-event. However, what is a little different this time is that the skins, as leaked by a Reddit user, are based on the ancient Chinese novel, Journey to the West. For those that don’t know, Journey to the West is the Chinese version of the Canterbury Tales. As such a great deal more serious, but nonetheless filled with a great deal of ancient folklore alongside the Buddhist journey to enlightenment. Journey to the West is an extended account of the legendary pilgrimage of the Tang dynasty Buddhist monk Xuanzang who traveled to the “Western Regions”, that is, Central Asia and India, to obtain Buddhist sacred texts (sūtras) and returned after many trials and much suffering. So this “event” may be just skins and loot, or it could be another event with an interesting story behind it. The Overwatch characters are represented as such: Winston is the monkey king Sun Wukong, and Zenyatta is his Buddhism master Tang Sanzang, apparently. Roadhog is the pig monster Zhu Bajie, and Reinhardt is the river monster Sha Heshang. The ad in the post also mentions the dates January 24th to the 28th, which coincides with the various dates between now and the 28th that the Chinese New Year festival covers. Therefore, these dates likely mean the duration of which the skins and loot will be available. Are you going to be grabbing these skins? Are you hoping it will be a full-fledged event? Let us know in the comments below!